Thermochemical conversion of biomass is considered as a key technology for greening fossil based energy and chemistry systems. A serious drawback for using biomass resources is the variability of the feedstock in time and place. Especially when using waste or residual biomass sources a pretreatment is necessary before the full potential of biomass can be used. Thermochemical technologies, like torrefaction, pyrolysis and gasification solve this issue. Biomass is converted to a commodity (either solid, fluid or gaseous) that can be used for a wide variety of energy and chemical applications. Through using thermochemical conversion the biomass characteristics become less important, and the use of for example white pellets or soy oil is not a necessity anymore. This makes it possible to use for example agricultural and forestry residues as feedstock for green chemical applications, but also the biomass fraction of our waste can then be used in high value applications. From a sustainability point of view this is a big advantage. 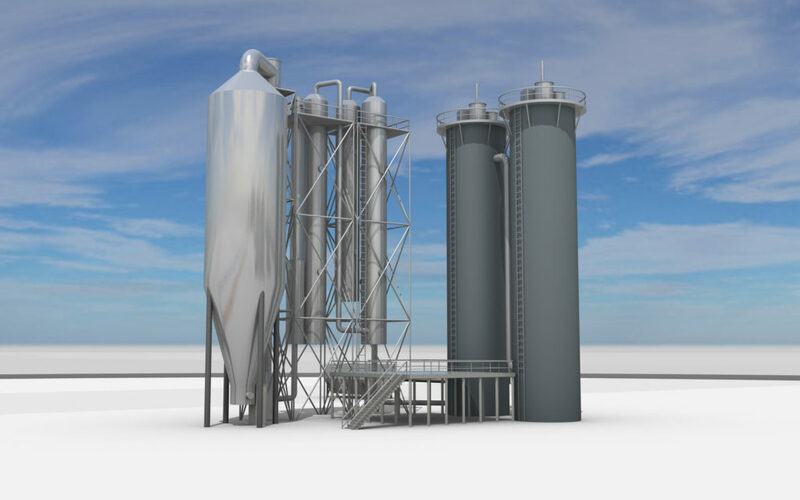 Torrefaction is the first step in the biomass conversion and application process. The word torrefaction is derived from the French verb “torrefier”, meaning to roast, and is chiefly used for describing the process of roasting coffee beans. In the context we use it here, torrefaction means a mild thermal treatment of biomass or raw materials containing biomass under low-oxygen conditions. In this manner, torrefaction makes the production of replacement products for fossil fuels possible. The resulting bio coal can be used directly in traditional coal fired power plants or serve as a feedstock for further biomass processing. This significantly reduces fossil CO2 emissions, with the technology playing a significant role in the greening of power installations currently running on fossil coal. When compared to using biomass directly as a fuel, the important advantages of this replacement fuel are its greatly improved energy, logistic handling and grinding qualities. Torrefaction is the key technological process for achieving high quality transformation of biomass or raw materials containing biomass into energy. Biomass (either torrefied or not) can be converted to green syngas or bio oil. In an oxgen poor environment the biomass is heated to 500 °C (pyrolysis) or more (gasification). 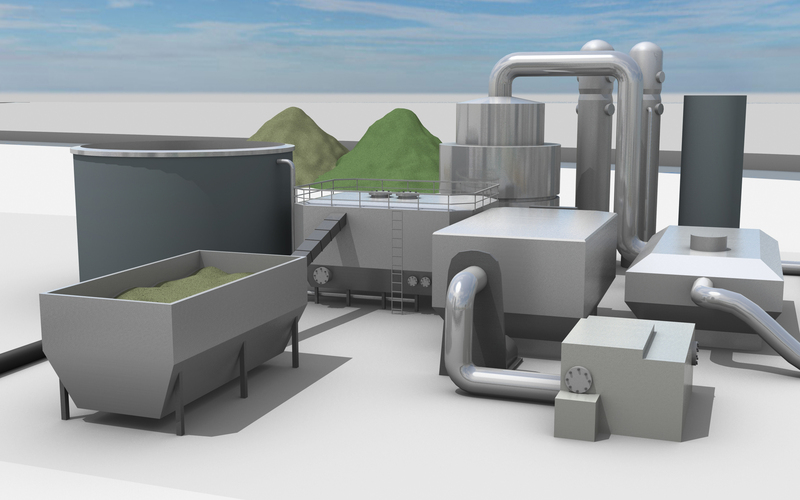 A pyrolysis plant produces bio oil, which after treatment, can be used as energy source or biofuel. Additionally, this proces yields biocoal as a residual product from pyrolysis. Depending on the quality biocoal can be used a soil improver, activated carbon, or as replacement of fossil coal in industrial applications. 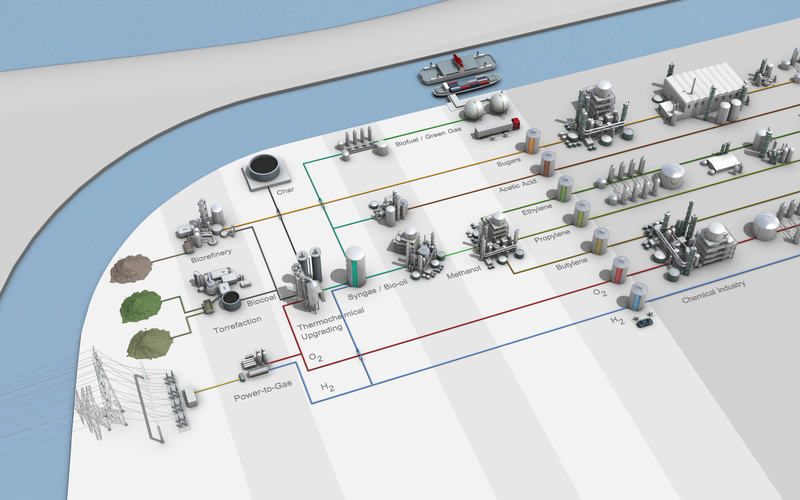 Gasification yields a green syngas, and can use either homogeneous biomass or biocoal as feedstock. The syngas can be used as feedstock for chemical industries, or can be fed into a CHP for production of electricity and heat. For most applications the syngas contains too litte hydrogen for a complete conversion of the biomass carbon. Adding hydrogen through Power to Gas increases the proces efficiency. 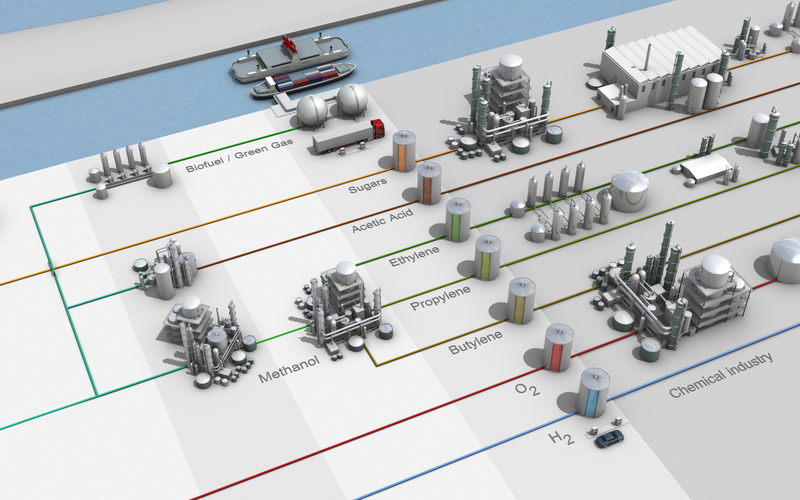 Thermochemical biomass conversion can make the chemical industry more sustainable. Worldwide this industry is one of the largest use of fossil resources. 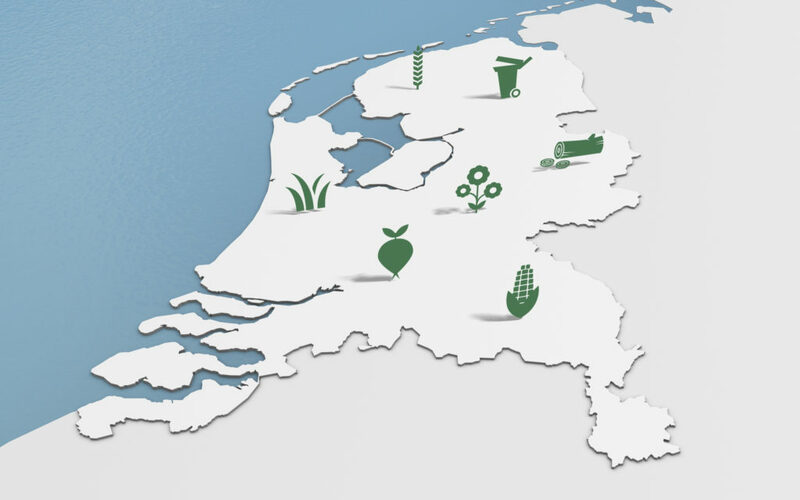 In the Netherlands 22% of the annual fossil resource consumption is used as chemical feedstock. Transition towards renewable resources will have a big impact on the mondial CO2 emissions. Thermochemical biomass conversion opens the door to large scale production of alternative feedstock for the chemical industry and fuel sector by making bio oil and bio syngas from biomass. Bio oil can be used (after upgrading) for the mobility sector and bio syngas can be used as feedstock for the chemical industry. It is the basis for the production of organical chemical products like methanol, acetic acid, DME and methane. Also the carbon residu that is produced in the proces can be used in applications where nowadays fossil coal is used.